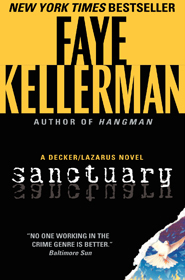 SANCTUARY is lucky number seven in the series. When an Israeli diamond dealer and his wife are murdered in their posh home, the homicides take Decker and Rina to New York and onto Israel. I had a good time researching this novel. It included a trip to the holy land with my daughter, Rachel, and exploration of the bourse, the diamond exchange in Tel Aviv.